Good morning everyone!! 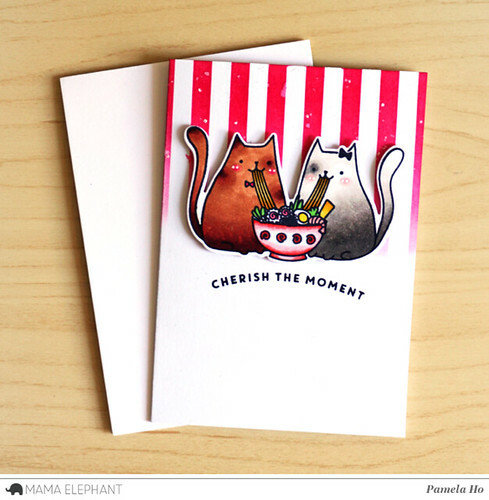 This is Pamela on Mama Elephant with a project using the adorable Nom Nom KItties. This card was created right after I got home from Japan and it was making me crave ramen! I first coloured my little kitties. 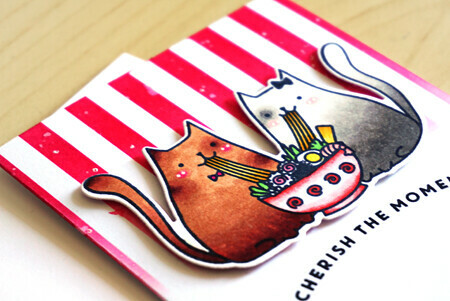 I decided to work with the largest stamp, which is Mr and Ms Kitty having a good time eating ramen together. Then it was time to do the background of the card. I wanted a simple background. 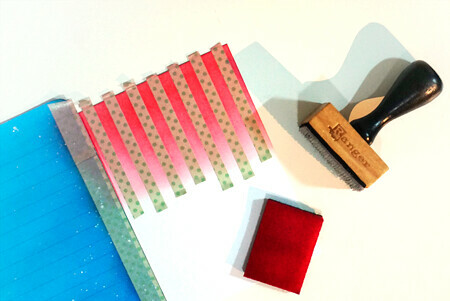 Since red is the perfect colour for Japan, I did some gradient stripes on the card and added some white paint and glitter to the back. I couldn't find a better sentiment than "Cherish the Moment" for this sweet image so I stamped it at the bottom and adhered the kitties with foam tape onto the card. And here you go! A very simple and adorable finished card! New copics in Japan also gave me an excuse to try new colour palettes! It's just so adorable! 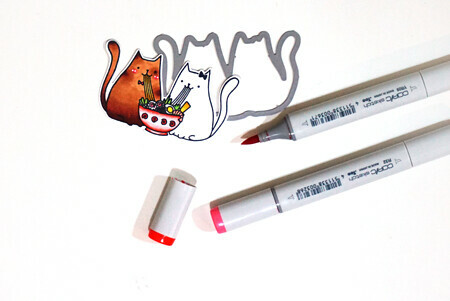 Those Nom Nom Kitties are next on my to buy list! Cute card, love the stripes! OMG! I adore ramen, but in my town in Italy is very hard to find...your card is so nice...love the stripes! I love this card! So vivid and colorful. New Copics in Japan? Does that mean more colors are coming out? I hope you enjoyed your trip!